Prepare for your big day in the privacy of a separate bridal party area. When the moment is right, step out onto a wide expanse of beautiful, white beach for an entrance that will take everyone's breath away. Stand with your partner and celebrate your commitment to each other beneath our decorated wedding arbor with the aquamarine waters of the Gulf of Mexico as your backdrop. Then it's time to celebrate! Indulge in the experience of snowy white sand between your toes, the soft rhythm of rolling waves, and the most beautiful sunsets in the world. Weather not cooperating? No worries. We have weather screens to keep you and your guests dry. 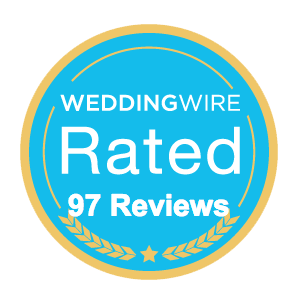 Consistently recognized and awarded as one of the best wedding and reception locations in Florida. The Sandbar Pavilion provides an open-air space perfect for a wedding, corporate event or upscale family gathering. The food and drinks were delicious and all the guests commented on how good it was. The setting is gorgeous with the white sand and blue sea providing the best backdrop to the ceremony and reception. The staff could not have been more accommodating - Molly, who we worked with throughout the process, was professional, enthusiastic, honest and accommodating...she made the whole planning process very easy. Jim, who managed the event on the day - was also so helpful, professional and efficient yet still personal. We would recommend this venue to anyone looking for an idyllic beach wedding.